The glass bottom boat is designed strategically to give it a look of an aquarium from the bottom. The visitors can sit on the couches placed on top of the robust glass base of the boat. 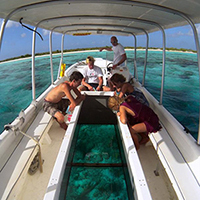 If you want to experience, the marine life without even getting wet, then booking a glass bottom boating is the best option for you. 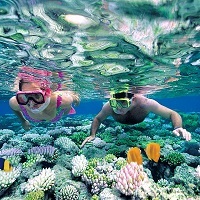 So, discover the beauty of the deep ocean by booking a bottom glass boat trip for you and your family. 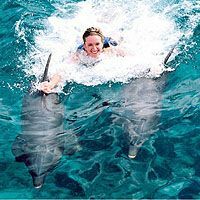 You must have enjoyed a horse ride or an elephant ride at some point in your life, but have you ever dreamt of riding on a dolphin? If you did, then it is time to make your dream into a reality. 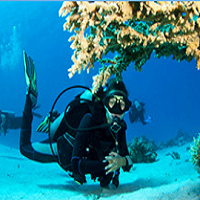 Adventurous Andaman is a trustworthy travel agency engaged in providing excellent services for conducting the dolphin ride for the adventurers. 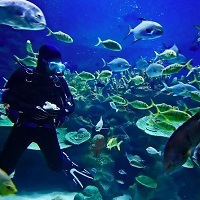 The duration of the dolphin safari may range from 30 minutes to 45 minutes. We will provide you a life jacket and some other safety equipment would be attached to your outfit before the ride. So, contact us anytime.